Woodbank at Shankill, County Dublin is currently being developed by Ravenshall Developments which is run by Matt Gallagher, Eoin Gallagher and Frank Gunning. 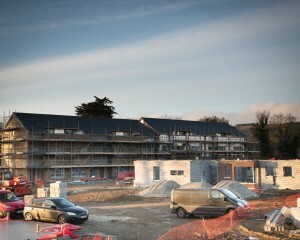 The scheme consists of 40 houses and 18 apartments and duplexes – all fitted out to the highest specifications. Weather permitting they are looking at a late April launch. There is a strong demand out there, says Matt, particularly in Dublin where prices are obviously more expensive but there are challenges too, he adds. The first of these that Matt mentions is in relation to the Central Bank mortgage lending criteria. It makes it quite hard in Dublin he says. “Take someone buying a house at €300,000, they have to find a €38,000 deposit. “Add to that the fact that first-time buyers are often in rented accommodation – they are trying to save for this deposit and pay rent at the same time. “You might ask how it affects the markets. Well, the ‘trader-uppers’ are generally moving out of say, a three-bedroom house in an older estate coming onto the market at maybe €350,000 to €400,000. “If the first-time buyer cannot afford that house then those people cannot move up to a new house which might cost in the region of €500,000. The whole chain is affected. “Sales are falling through because the chain is being broken. “It is a double-whammy as you also have the limit of three-and-a-half times the salary. To be honest,” says Matt “I don’t think that is reasonable. “I think the banks had a system before the Central Bank stepped in – having been bitten before they came in with very strict guidelines. The other issue that is affecting the whole business is building costs, says Matt. It has become very expensive to build. “All during the recession there were increases in the building regulations requirements,” points out Matt. “You had the BC(A)R regulations brought in – for very good reasons. But in my opinion they went over the top. There have been some welcome attempts by the Department of the Environment to deal with some of the cost issues, says Matt, particularly with regards to apartments. Here Matt is referring to recently introduced design standards for new apartments. There has been a bit of controversy, he acknowledges. “But,” he says, “no developer I know will build anything down to the absolute minimum. What’s being missed in Matt’s opinion is the fact that, as he says, “what these regulations have done is to bring flexibility into the equation again”. “You can have a 75sq. m or 80sq. m apartment if you want, or a smaller one – but realistically, for most people, they want to have a range of sizes – not a one-size-fits-all. “What they have done is to introduce a bit of flexibility. That is going to be helpful. “These things are evolving and if it is demonstrated that there are anomalies then I am quite sure they will look at them and the thing is they can look at them now and can introduce them. Looking forward, Matt says the demand is there but there are a lot of issues that have to be dealt with. “We are in an awkward situation,” he says. “Rents are sky high. That means people’s ability to save is limited. “There are new people coming onto the market all the time and if this goes on we are going to have a real crisis on our hands in my opinion. “I know the Government are making serious efforts do deal with social housing. “They have to get production moving again in the normal housing market for home buyers – and rents need to become more affordable in the private rented sector so that people who would prefer to be renting on their own or buying can find a place at a reasonable cost. “I think one of the things they should be looking at is the cost of money and availability of finance. Our image shows Woodbank at Shankill.